Have you ever been in a situation where you needed a thesaurus and weren't near one, or near a computer? If so then iThesaurus is the answer. With access to over 140,000 different words, and ability to get the definitions as well, you are sure to find whatever you are looking for. 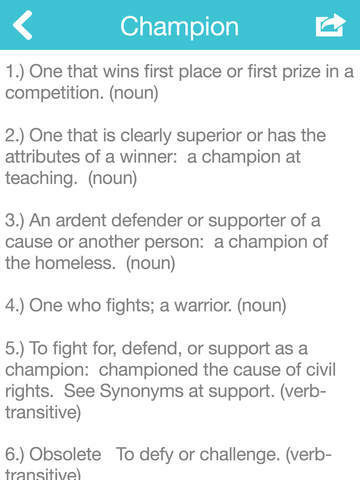 Containing both synonyms and antonyms this is sure to be the end all be all for your thesaurus needs. Featuring a fast and simple user interface anyone can use it. Let your kids use it for reports, reference it when sending emails or other correspondence to better get your point across. Your vocabulary will be growing in no time with this handy thesaurus. - Share definitions on Facebook, Twitter, and Tumblr or thru email without leaving the application. - iThesaurus can now pronounce over 636,000 (and counting) words. Look for future updates and new features, we would love to hear your comments and suggestions. **Note this application requires an internet connection or 3G. Thank everyone for making iThesaurus such a great app! We appreciate you all. We would like to thank all iThesaurus users for making this such a great app! Thanks for all the support and encouragement. 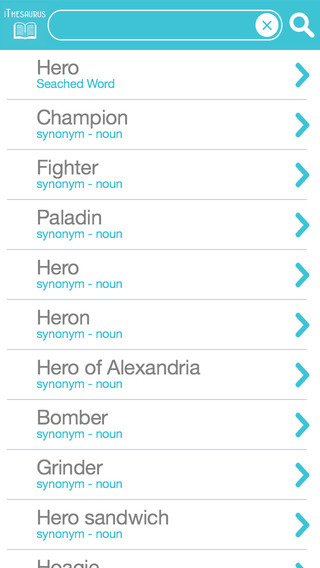 We hope to continually make iThesaurus one of the best dictionary/thesaurus apps for your iPhone. -Fixed iOS 3.x compatibility, no more opening app crashes! Fixed crashing bug and backwards compatibility. Now users on iOS 3.x can use the app again without it crashing on startup. - Added the ability to share definitions on Facebook, Twitter, and Tumblr all without leaving the application. - Fixed email sharing so it no longer leaves the application as well. - Look for the speak button on the top right of the definitions you can now hear over 636,000 (and counting) pronunciations. Thanks for all the support in making iThesaurus such a hit! Please drop some feedback if you like the improvements, and if you have ideas to make things better, we are always wanting to hear those too. Carried over the gray gradient theme across all pages, moved the email definition button to the top right in the nav bar. Changed the nav bar color to mach the color scheme, everything looks more polished and buttoned up. UI touch-ups to make things look a little better and a little bit snapier. The application now supports landscape mode throughout. Added a splash screen as users were confused when the app was actually ready to be used. Updated UI performance and added small ad at the bottom to help keep this app free. I am sorry for the ads, but I feel this app should be free and this will help with the cost associated with the API. Please update to this version to keep iThesaurus free! Small UI tweeks to improve speed and performance. 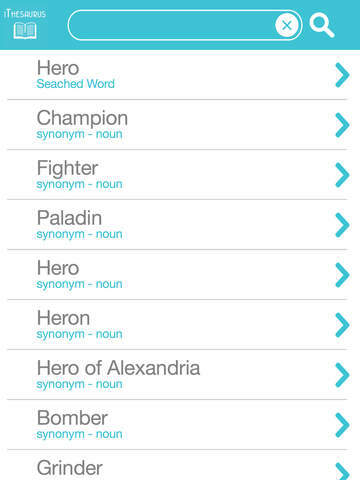 This small update allows you to email a definition from any word that you looked up. Thanks for the suggestion, and keep them coming. We have listened to the reviews and this version now has the dictionary ability. Simply just tap on a word that came up from a thesaurus search, and the definition of that word will be displayed to you. Thanks again for the suggestion and help in making this an even better application. What I like is it get's right to it. Type the word in, hit go and presto...the results appear quickly. Great for when working on blogs. So far it's had all the words I've entered.